When I started getting into running and fitness I decided to really focus on what was important: what do I wear? I went through a lot of brands and styles until I found things that I liked. For the most part, I became pretty partial to racerback tanks and form fitting pants. I don’t like sleeves getting in my way when I run and I like my pants to “hold it all together”, if you know what I mean. That’s pretty much how it went on for a few year: me shopping around and finding things I liked here and there, but never really committing to any particular brand of bottoms or tops. I’m 4’11” so finding pants that are short enough and capris that don’t look like pants is hard. It wasn’t until recently that a friend turned me onto the brand Skirt Sports. Skirt Sports is a brand created by women for women. It’s about feeling pretty and feminine while getting out there and doing the dang thing. For some people it might sound silly but I love getting all cute and then going out and running my face off. I’m single, okay? 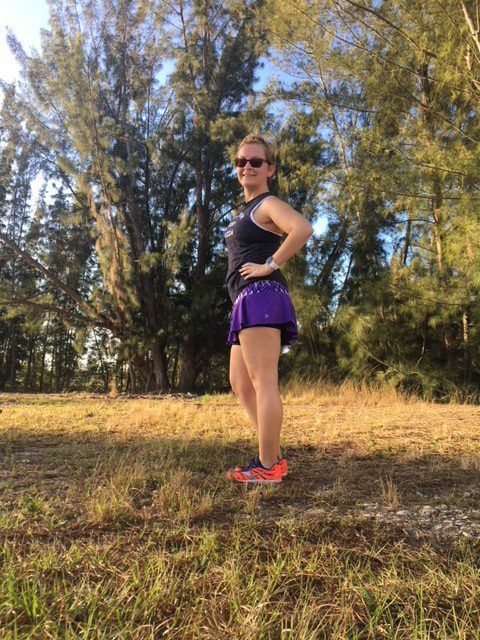 I was kind of iffy about running in a skirt simply because I’d been stuck on wearing compression pants and shorts for years. My body just liked them. They were comfortable in them. We had become one, the compression pants and I. THEN – I was recommended the Lioness skirt by my BFF and RBFF (Running Best Friend Forever). It’s short and ruffly with built-in shorties. 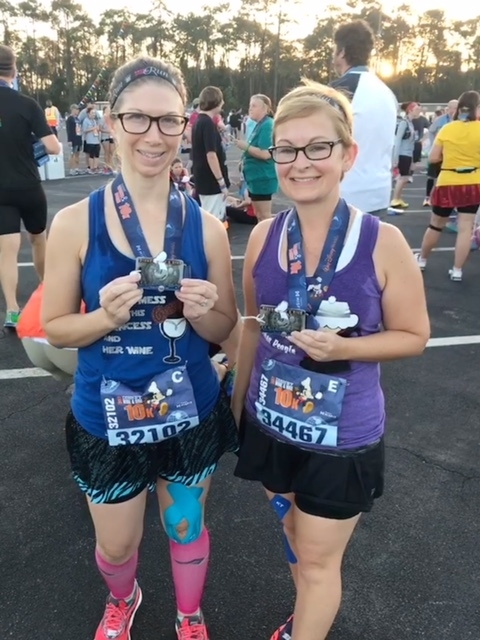 Michelle and I rocking our Lionesses after the Disney Wine and Dine 10K. In fact, most of the Skirt Products have pockets. And I’m not talking about that tiny little key pocket in the back that gets all sweaty as soon as I step outside into the blazing Florida sun. Pockets on each sides to keep your phone, your fuel, your keys. Heck, probably even a tiny book. (Yo, if you find any tiny novels let me know.) It also has the little pocket in the back, in case you were wondering. After my Lioness, I fell in love. I bought a couple more and now I’m a girl that runs in skirts. My friend, Sarah, killing it in her Sidewinder Lioness during her lunch break because #REALwomenmove, y’all. Me, rocking the same print on a balmy run because, also, real women take selfies. Skirt Sports is more about skirts, though. There is a huge variety of fitness wear for all types of bodies. Their mantra is #REALWomenMove and, as of Feburary 1st of this year I’m so proud to serve as an Ambassador for this awesome company (with some friends too!). On top of being in the company of some amazing women athletes (like our very own Jenn), I also get a pretty sweet discount and a code to share with others! Since I became an Ambassador I’ve been on a bit of a shopping spree. Well, technically it’s only been a couple of weeks, but I’d known for some time and decided I need to add to my collection a little. My thinking is that, if I’m going to share and love the brand then I really need to live the life, right? The Lioness is definitely one of my favorite items, but I’ve also become smitten with the Gym Girl Ultra. It’s got more of a classic, straight feel with built in shorts and, of course, pockets. As far as pants go, I’m loving the Pocketopia capri. They’re light and breezy with pockets on each side to hold all my important things: my phone and maybe some snacks (or a key if I’m out on a run). 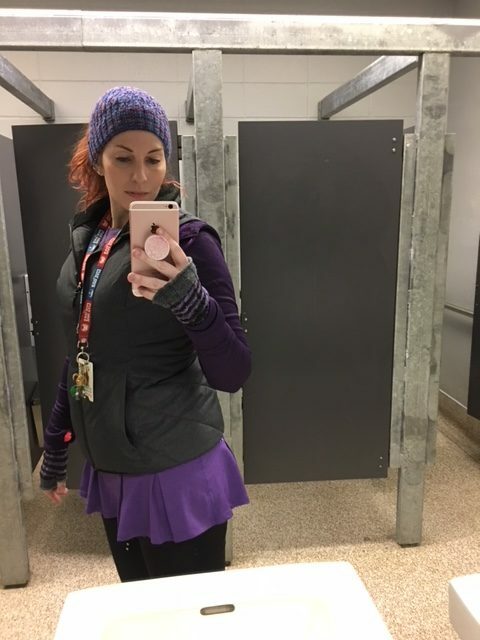 I’ve worn the Pocketopia on a walk/run and for a workout and they’ve been awesome both times. The Redemption capris are also super comfy and I snagged a pair in a gorgeous print. They don’t have pockets on the sides, however, and that’s what made me fall in love with the brand. Loving these Pocketopia capris in Perseverance! I’m seriously looking forward to loading up my cart with some awesome sales this weekend on some old prints and some newer stuff. If you’re into cute, good quality workout clothes, and empowering others check out www.skirtsports.com. You can use the code 920Veal for 15% off your purchase! 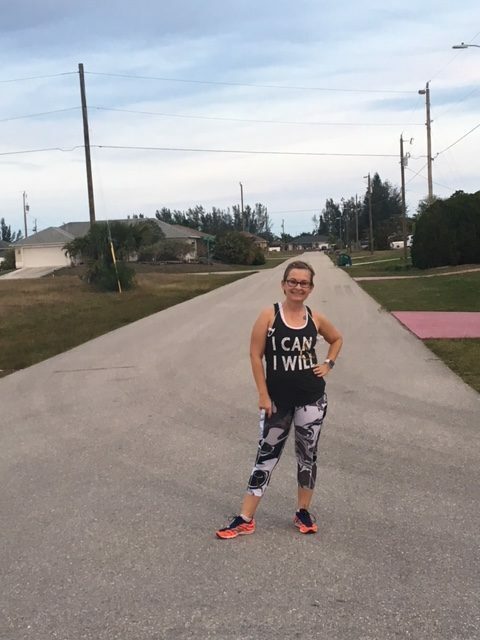 This entry was posted in brand ambassador and tagged #skirtsportsambassador, activewear. Bookmark the permalink. I have a few Skirt Sports items in my closet, thanks to Jenn but I definitely think I need to invest in one of the skirts (which I don’t have yet!). Decisions, decisions! When you come visit, we’ll go to the Mothership, aka the Skirt Sports store in Boulder. That way you can try stuff on! Yes! Maybe the Gym Girl. It’s light and comfy, but not too ruffly. That lioness looks great on you. You look adorable in Skirt! And welcome to the sisterhood, I know it will be meaningful for you. It is for me! The Lioness is my fave Skirt too, especially for long distance. I can’t wait to see your collection grow. Because it will, it’s an addiction. Looking good! The more I see it, the more I like lioness. I think it’s a #neverwear for me though…so, may have to get brave and give it a whirl this summer! She’s my favorite! Try it!